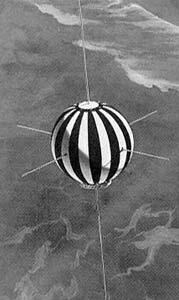 San Marco 1 was an Italian flight test of the satellite to furnish data on air density and ionosphere characteristics. The Scout-X4 launch vehicle was provided by NASA and was launched with an Italian launch crew from Wallops Island. San Marco 2 was a 66-cm-diameter spherical satellite with two experiments, one designed to make direct measurements of air density below 350 km, and the other an ionospheric beacon experiment developed to observe electron content between the earth and the satellite. The spherical shape of the spacecraft was important to the air density experiment in that it provided a constant satellite cross section to the decelerating effects of the air. This simplified data interpretation and eliminated the need for satellite attitude control. A 5-m dipole antenna was extended along the spin axis only when the beacon experiment was turned on. Four 48-cm telemetry and command antennas extended symetrically outward from the satellite equator. The satellite had black and white longitudinal sections painted on its surface for thermal control. The satellite mission was to study density and its small-scale variations and to study equatorial electron density irregularities and ducted radio propagation above 200 km. The satellite was powered by four battery packs, and rough measures of satellite attitude were provided by four solar cell sensors. The satellite performed as expected until 5 August 1967. By August 14, power had decreased so that satellite command was no longer possible. Reentry occured on 19 October 1967, during orbit 2680. Two suborbital tests of the San Marco satellite were flown on Shotput launch vehicles.